The family came down to San Diego to see Grandma for Easter so it seemed a good time to get some easy hikes in. After two previous attempts, the Merriam Mtns HP hadn't been far from the top of my todo list. With a smooth, 20-foot granite obelisk for a summit block, I can confidently say it's the most technically difficult range highpoint in the state. I sent a note to Mark to see if he was available since he had previously offered to bring a ladder for the next attempt. We settled on late Friday afternoon, and then sent out a plan to a number of others that had expressed interest in joining us. This grew to include some others that I knew might be interested, and it seemed that we might have a dozen for the main event on Friday. My daughter joined me for an easy hike in the morning to a pair of summits near Lake Hodges before we had lunch in Escondido. I dropped her off back at Grandma's before doing a few more easy ones and then meeting the group for the finale. All in all a rather fun day. These two peaks are located on the south side of Lake Hodges, just west of Grandma's home in Rancho Bernardo. The land surrounding these two peaks is undeveloped, though it's unclear whether it is private or public. There are no signs or fences along the perimeter, nor regular trails or signs of common use. We started from Alva Rd, east of Peak 1,109ft. Galena Canyon Rd heading west goes up to a water tower towards the south. We followed the road until it turns south, then headed off on a faint trail leading to an old, faded ranch road heading west. The road peaks and starts downhill before reaching the top, the last 100yds involving some easy cross-country to the top. A home is found immediately to the south with the summit northwest of the house, the highpoint found within a fence housing a collection of water tanks. We walked part way around the fence to ascertain this, then looked for a way in. The baricade is formidable, with three strands of barbed-wire at an outward angle topping the high, chainlink fence. A section of the fence had been cut away and a flimsy gate installed at a later date, probably when they were putting in the newer plastic tanks. Upon closer inspection, we noted the gate was only held together with some thin wire ties which we found easy to undo and allow us to slip through. We took a photo at the summit rocks and then scooted back out the fence, tying things back up. We next returned to the old road and followed that northwest to the sister summit half a mile to the northeast. The two summits are nearly equal in height and it is difficult to tell from the topo map or from observation which is higher. The second is nicer in that it has no water tank or other eyesore and has a nice view overlooking Lake Hodges to the north. All along our hike Jackie had been picking various wildflowers and arranging them as a bouquet in her shirt pocket. I had to admit it looked rather colorful. In a bid to shortcut our return, we struck off on a cross-country descent to the east down to a small pond. This 1/3mi effort turned out to be more difficult than expected, with heavier brush than we'd found up to that point. Jackie was a good sport about it and followed me through the stuff without complaining. At the lake we came across a woman with two children playing at the water's edge. We sheepishly asked where to find the trail and followed it back to the neighborhood where we'd parked. We had lunch at the IHop in Escondido before considering further hikes. Mom was looking to take Jackie for a pedicure and for her part Jackie wasn't all that excited about sharing me with 10 perfect strangers on the Merriam Mtns HP attempt. So I took her back to Rancho Bernardo before continuing on my own with a few more easy hikes. Located on the east side of Interstate 15 near where our group was to meet, this summit is located next to a water tank and entirely on private property. There is an old, no longer driveable dirt road that can be followed to the water tank from where I started just off Mountain Meadow Rd. There are no signs indicating private property or No Trespassing, which encouraged me. An elderly, white-haired lady came driving by in a golf cart - she had evidently come out to the pavement to check for mail - pausing to ask what I was up to. When I told her my plan to go for a short hike, she told me it was her property. Seems she was one of the owners of the Stickly Ranch that owns most of the property around here. We talked briefly and she seemed happy to give me permission when I asked if it would be ok for me to walk to the highpoint. She left me with, "Watch out for rattlesnakes!" as she smiled and drove away. I followed the road for about a mile through her property, passing by a fenced-in avocado orchard that looks to be no longer maintained. Nearby is a small reservoir with lots of old irrigation pipes that stopped being useful ages ago. Perhaps they just gave up the farming of avocados with age or declining prices. There seem to be lots of abandoned avocado farms on the hillsides around Escondido. Once at the water tank, a use trail leads around the east side of the fence to the rocky highpoint where a short, class 3 boulder problem finishes on the summit rocks. There is a nice view overlooking Escondido to the south and a benchmark found just west of the summit block. Nice little hike. My route went within view of several homes near the summit which would have made me nervous had I not run into the owner earlier - best to get permission for this one, if you can. This short summit hike can be started from the same Park N Ride lot that our group met at. It rises above the interstate on the west side, easily visible from the start. I had about 50min to make the hike to the summit and back, less than 2mi, all told. The land is signed for Private Property and No Trepassing, but it seems to be regularly ignored. An old road can be followed up most of the way. Where it reaches highest on the east side of the summit, a use trail can be found leading to the top. The highpoint appears to be a large, 15-foot granite summit block, vertical on all sides and devoid of holds or cracks. This would be another candidate for a ladder. I had enough time to buy a large fountain soda at the AM/PM before getting to the Park N Ride with about 5min to spare before our 4:30p meeting time. 6-7 folks were there before I arrived and more arrived over the next few minutes. Mark had gotten off work earlier than expected and driven the ladder up to the water tank just below the summit, stashing it in the bushes. He'd found a better driving route up the east side of the mountain, that would make the hike to the summit block 5min rather than half an hour. We waited until 4:45p for any stragglers, then drove in three high-clearance vehicles to the water tank. In several places the road is seriously eroded, but two Grand Cherokees and Mark's large truck managed it with little trouble. We carried the ladder, some ropes and other gear, a cooler of beer and a bag of snacks up the remaining undriveable section of road leading to the top. I use the word "we" loosely because I didn't carry any of this stuff personally. Despite the short distance, it was surprisingly treacherous, with loose sand over steep, hard-packed dirt that resulted in several falls among our group, and the ladder proved quite unwieldly. We eventually got to the summit area and quickly set the ladder up against the summit pinnacle. We knew in advance that our 16-foot ladder would be short and Mark had brought several ropes and some other gear to facilitate making it work regardless. 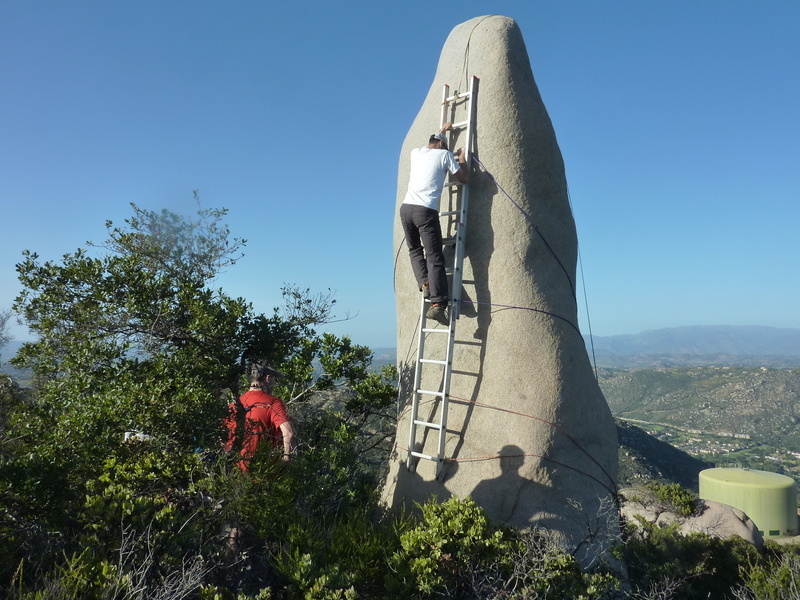 The basic plan was to strap the ladder to the rock starting several feet off the deck, tying the ropes off with enough friction around the pinnacle to hold the ladder and our weight. Mark did the bulk of the rigging work, using carabiners for leverage to draw the ropes tightly around the granite block and tying them off to small trees and shrubs behind the block. And almost unexpectedly, it worked pretty much as hoped the first time. As one of the lighter folks, I went up first to test it out, adding an additional stretch of webbing over the bock for added security. The top of the ladder came about 3' short of the top, making it quite nervy up there. The summit is quite narrow without barely enough room for one to sit, so narrow that it would not have been comfortable sitting on it with both legs on the same side of the rock. So the four of us bold (or foolish) enough to sit up there straddled it like a horse. No one dared to try standing on it. Most were happy to simply touch a hand to the highest point. Over the course of about an hour we took turns on the ladder, making slight adjustments periodically, cracking beers and jokes as appropriate and generally having a grand time. Laura was the last to make the climb up the ladder, after which we disassembled the whole thing, packed up our gear and headed back down with an hour of daylight yet remaining. A great time was had by all, me thinks. Upon my return to the van after everyone had left, I found a note on my windshield from Mark Adrian and Richard Carey, two San Diegan highpointing legends. Both have nearly completed a long list of California range highpoints. They had driven to the TH on Camino Mayor on the west side of the mountain and waited nearly two hours for us to show up there. That had been the secondary meeting place for those that were late to the first, and was originally the route I'd planned we'd take up. Unfortunately they completely missed our party up on the mountain.